Pro nat's was a disaster. I had three straight 12 hour days of travel from France to DFW to Portland combined with 2 days on either end of no pool time. To sum it up, I have been swimming the best I have since college, but with the preceeding 6 out of 7 days before the race with ZERO swimming, I was in for a shocker. I dove into the water and was struggling like I never have from the get-go. My stroke felt aweful, and the body was tired. I never recovered and things actually got worse throughout the swim. I was swimming so hard I was loosing my lunch and was quite cold and dizzy, but going nowhere. I came out WELL behind the leaders in the second pack. It took me about 3 of the 8 laps to feel a little better on the bike, but this was more like going from being on death's doorstep to aweful. Onto the run our group was well back of the leaders, my heel hurt, my motivation hurt, and I didnt feel like killing myself just to slug through to the finish. I stepped off the course. I am still debating whether it was the right decision up to now. Looking back, a 12-15th place (my estimation on my place if I would have finished) would have garnered me nothing but a few measely ITU points which I dont really need right now, and would have required me to limp for at least 3-4 days. I thinking packing it in was the smarter choice, although I have to deal with the emotional ramifications of that choice now. What really frustrates me is that I havent had a solid ITU race on American soil. 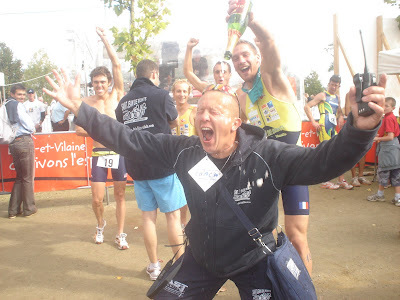 Every single ITU race I have done in the last 3-4 years in the USA has gone terrible. There are myriad different reasons for each of the races. I just want to have 1 good race in the US! Is that too much to ask? Oh well. It is time to focus on the next one. This time the next one happens to be in China again. This week (as in 5 days from now). So as I sit and type this blog, I am in Vancouver on the way back to the Orient. Hopefully the body can hold together and I can put together a solid race. We shall see. Well I finally cracked one! It wasn't the perfect race, and I think I can still race better, but it was a breakthrough for me. 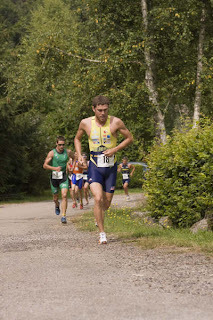 During the race in Scotland last week I did something to my heel (as if I haven't had enough problems with my feet). It has been so sore I couldn't run on it all week. Heading into the race this weekend I was pretty nervous. As someone who prefers to run a lot of miles, this "no running" strategy wasn't exactly good for my confidence. And on top of the heel, this was a huge race for our team. In the French Grand Prix Series (much like European football….or soccer to uneducated people), the bottom 2 teams from D1 go to D2 and the top 2 teams form D2 go to D1. Our team signed me and some other foreigners for the sole purpose of helping the club go to D1 next year. Going into the last race, we were in second place, but only by a hair. For the last month, (and especially since Scotland) I have really been focusing on swimming and riding since my body has not cooperated on the run. After the most recent heel issue, it was decided by me that I would no longer "sit in" on the bike and wait but to attack the swim and the bike to get in a breakaway. All the US guys that race with me would be shocked. This race was one of a few that went exactly according to plan. I had an awful start to the swim (sometimes it is expected when you have 105 guys and 150meters to the first turn buoy), but my fitness came through and I clawed my way into 4th out of the water. Along with another teammate behind me, we had a break out of the water. I hopped on the bike and took off. It ended up being 9 guys in the break. I pushed really hard and felt solid on the bike. We were pretty disorganized, but managed to hold off the second pack. The gap grew to 35 seconds to the chase pack (which consisted of about 60-70 guys), but the last lap of the bike we lost quite a bit of time and ended up only having 15 seconds or so. Not too much time for all our hard work, but better than nothing. Next I went onto the 5k, 3 lap run, in 3rd position and ran well for the first lap. The 2nd lap I got passed by two guys to put me into 5th going into the last lap. I was feeling ok, but the quads were cramping pretty badly. About 800m from the finish I got caught by 2 more guys and we ran together all the way to the finish chute. I didn't have the finishing speed and ended up getting out sprinted by both (one was my teammate) for 7th place. I still think I can race better, but all things considered I am happy. 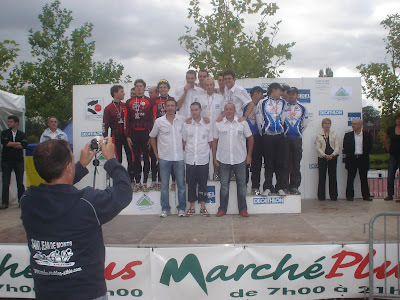 This was by far my best place in the FGP this season and things look good for racing in France again next season. In the end, our team finished 2nd on the day which catapulted us to 1st in D2. Champions of France D2!!!!! So not only do we go to D1, we are the champs of the 2nd division. As you can see from the above pic our manager, Eric, was ecstatic about our victory. He didn't sleep the week before the race he was so nervous, and was crying afterwards. What a perfect way to end the season of racing in France! I am now in Denver airport en route to Portland for the USA National Championships. While the French season is over for me, I still have a few more races and heaps of travelling! Fun, fun. After Portland I have 1 day in San Fran and then off to China for another race. I will post some musings on a summer racing abroad shortly. What a crazy, but wonderful experience. I think words hardly will do justice to the memories. Cheers, and thanks for reading. 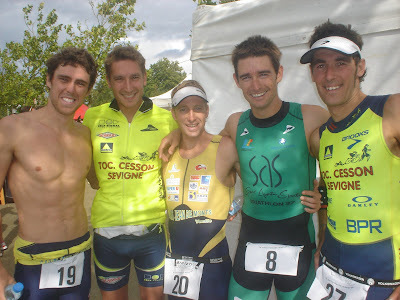 Les Etrangers aprѐs race [l to r: Moi, Nico(francais), Adam, Jason, and Kris (Aussie, Aussie, Aussie)]. Before I digress....to the race. It was an exciting, but unusual format of 300m swim/10k bike/2k run with prelims and finals. First 10 in each heat automatically go through to the finals and then the next 5 fastest times. Super-fast racing. I was looking forward to a good workout and sharperner for our next French Grand Prix Race this coming weekend. The first heat went great. I sat on Ali Brownlee's (British Olympian) feet for the entire swim to exit the water 2nd. Got onto the bike and felt great. Ali attacked up the hill, and no one followed, so I chased, and chased, and chased. No one would work with me and I had to pull the group around for most of the 10k bike. I had a good next transition and started the run off fast. I was running comfortably in 3rd, so I backed off to conserve a little energy for the final (which started 40 min after our race). A german dude must have forgotten that there are no points for the prelim when he sprinted past me at the line....no problem, an easy 4th and moving to the finals! Ohh, the final. This was not the time or the place to muck up the transitions. I had a good swim (other than getting breastroke-kicked in the eye socket around the first buoy), and excited the water 5th or so. Onto the bike, I made the same mistake as the first race, but this time Will Clarke (another British Olympian) attacked when I was putting on my shoes during the hill and broke up the group. Nobody would chase, so it was fellow FGP athlete, Pete Friedman and I who tried to chase down the lead group of 5. Not possible. We were stuck in no-man's land for the entirety of the bike, only to be swallowed up by the remaining 18-20 riders right before T2. I had good position going into T2, but struggled like never before putting on my shoes. I must have lost 10-15 sec alone in T2. I exited last. Ouch. Not what you want to do in a 2k run, as there is absolutely no room to make any time up. I caught a few guys, but simply couldnt turn my legs over fast enough and ran out of real-estate. I think I was 16th or something. Quite frustrating to say the least. Now I am back in St Jean de Monts (via Amsterdam, Paris, St Cloud, Paris, St. Cloud, Paris, Nantes, St Jean). Lets just say that yesterday there was no "training," but I might have set an official world record of sprinting 1k with my bike box (from train to train to embassy to pool to train to train). Time to get some rest, recoup, and roll out this weekend for the FGP! In l'etats d'Unis today is labor day. This has no real significance in France, except for the fact I am having some Passport issues here, and the good ole US embassy likes to take French AND American holidays off. So, I must wait until tomorrow to fix le probleme. Being that I am in France, and nothing can be done expediently, I am sure I will spend the better part of the week fixing the issue and not just tomorrow morning. Other than the passport headache, things having been rolling quiter along. I haven't raced in ages....i think maybe two weeks? What have I been doing all this time? Training, of course. I have put in three really solid weeks of swimming and biking, coupled with two decent running weeks. I wouldn't say that the issue with my foot is completely resolved, but it is getting better/manageable. I got in 50 miles of running last week w/ two track sessions and two other hard brick sessions, so while the miles might be a little on the low side, I have got lots of intensity. Overall volume has been good as well. Last week with almost no running I got in 22 hours, and this week I logged 26.5 hours. My body feels like it is holding together all right. I have one more large week in this "block" of training. And then the fun begins....again.